Achieve maximum polishing results with this pad care combo! The Wolfgang Pad Werks Pad Care Combo includes everything you need to maximize the performance of your polishing pads and lengthen their lifetime! Clean polishing pads produce better, more precise results. Polish residues, abraded paint, silicone, and caked on wax will negatively impact performance. 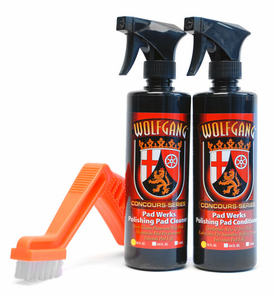 Use the included Pad Conditioning Brush with Wolfgang Pad Werks Polishing Pad Cleaner to restore the performance of your pads after use; then treat them with Wolfgang Pad Werks Polishing Pad Conditioner to increase their performance. Wolfgang Pad Werks Polishing Pad Cleaner 16 oz. Wolfgang Pad Werks Polishing Pad Cleaner will safely and gently clean all styles of polishing pads including wool, microfiber, and foam. Perfectly clean pads perform more effectively, which is why Wolfgang Pad Werks is engineered to provide exceptional cleaning performance. The cleaner the pad, the better the results. Wolfgang Pad Werks Polishing Pad Conditioner 16 oz. Foam buffing pads become caked with wax and polish after just one use. The Foam Pad Conditioning Brush removes excess, caked polish and restores the usable texture to your foam pads in seconds. Wolfgang Concours Series is a collection of world class car care products which achieve excellent performance through advances in technology and careful engineering. Trust your polishing pad performance with the latest in pad cleaning and conditioning technology with the Wolfgang Pad Care Combo. A total retail value of $44.97. You save $4.98!